Build strong, powerful calves with the XMark Seated Calf Raise XM-7613. 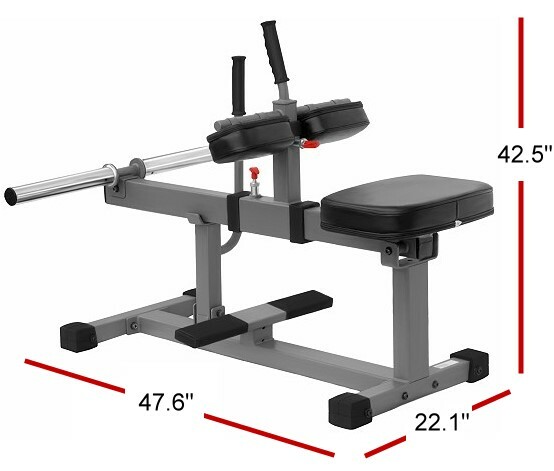 XMarks seated calf raise features 11-gauge 2 x 3 steel construction, bolted on skid resistant feet and a scratch resistant, baked powder coat finish. Calf raises increase running and athletic performance while reducing injury. Women get the shapely legs they desire by balancing the thighs and lower legs while men build strength and size. The XMark Seated Calf Raise is designed with height adjustable swivel thigh pads, dual Olympic weight posts and a wide, textured, non-slip foot brace bar. Add definition and power to your calves with XMark.